Colin Green Photography: The Flickr Top Five Most Viewed Photographs By Me. The Flickr Top Five Most Viewed Photographs By Me. I just thought it might be interesting to share what are currently my top 5 pictures an some of the stats about them on Flickr as of 3 September 2017. Currently this picture has 604 views and has been favorited twice with 1 comment. 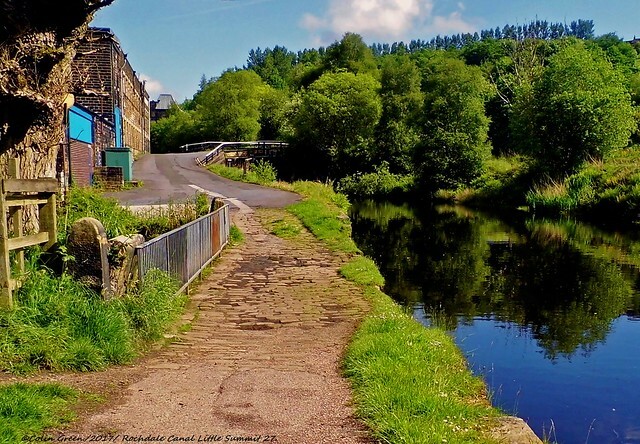 The picture was taken on a walk along the Rochdale Canal from Littleborough to Summit in May 2014 using a Polaroid iS2132 Bridge Camera. It was taken just inside the entrance to Wheatley Tunnel on the abandoned Halifax High Level Railway in February 2014 using a Polaroid iS2132 Bridge Camera. I did not venture any further in as I had not received any permission and had no safety gear with me. This picture has been viewed 755 times on Flickr. This again was taken on the Halifax High Level Railway in February 2016 showing the remaining entrance to Wheatley Tunnel, now sadly closed of for good as the other side has been infilled and had housing built above. What a waste as the tunnel and viaduct would have made a good cycle and pedestrian route connecting Pellon with Ovenden. This was again taken using a Polaroid iS2132 Bridge Camera in February 2014. This currently has been viewed 771 times but with no favourites or comments. This as of the 3rd September 2017 has been viewed 3995 times, favorited 131 and commented on 10 times. It shows the now abandoned and turned in to a private house Brockholes Railway Station, Nr Huddersfield south bound platform, the northbound is still in use. It was taken in May 2016 using a Nikon d3300 SLR Camera. Thanks to everybody who has taken the time to view any of my pictures and read my blog, your support is truly appreciated.